The fact that post-socialist EU countries are struggling with implementation of EU's social inclusion policy is well known. But why is that so? Are the problems solely connected to how inclusion policies are enforced, or could it just as likely be the way policies are designed that creates challenges? 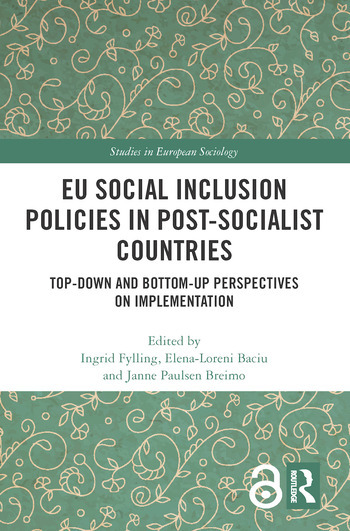 This book explores experiences with inclusion policy implementation in seven different post-socialist EU countries. It focuses particularly on two groups of people in constant danger of social exclusion: People with Roma background and people with disabilities. So far, researchers have studied these issues primarily through policy analysis, and thus not provided knowledge on what actually happens in local contexts where welfare services are produced. This book sheds light on implementation processes at different levels, both on the policy level and in local welfare production. The picture painted here is one of complex and conflicting considerations in inclusion policy implementation, between historical and cultural heritage from the communist period, and EU inclusion policy based on Western European political principles. This book will appeal to undergraduate and post-graduate students, as well as postdoctoral students in social science, disability studies, educational science and others. The book will also be useful for researchers and others interested in the development of inclusion policies and EU integration issues. 6. How Can We Understand the Poor Implementation of Disability Inclusion Policy in Romania? Ingrid Fylling holds a position as associate professor in Sociology at Nord University, Norway. Her main research interest is in disability studies and studies of local welfare services. She is also a board member of the Nordic Network for Disability Research. Latest publication (co-authored): Fylling, I. og L. Melbøe (2019): Culturalisation, Homogenisation, Assimilation? Intersectional perspectives on the living conditions for Sami people with Disabilities. Accepted for publication in Scandinavian Journal of Disability Research 2019. Janne Paulsen Breimo is a professor in social work at the Faculty of Social Sciences, Nord University, Norway. Her research interests include social policy and social welfare. She is the chair of the European Sociological Association’s Research Network on the Sociology of Social Policy and Social Welfare (RN26). Co-authored publications: Romanian Roma: An Institutional Ethnography of Labour Market Exclusion (2016), Networking Enforced – Comparing Social Services’ Collaborative Rationales across Different Welfare Regimes (2016), Planning individually? Spotting international welfare trends in the field of rehabilitation in Norway (2016). Elena-Loreni Baciu is an Associate Professor at the Social Work Department from the West University of Timisoara, Romania and a co-founder of the Research-Action Centre on Discrimination and Social Inclusion at the same University. (Co) Authored publications: Between Equality and Discrimination: Disabled Persons in Romania (2017); Exploring the social relations of Roma employability (2016); Romanian Roma: An Institutional Ethnography of Labour Market Exclusion (2016).